Hodgson Wetland, located in Hodgson Neighbourhood, has been protected since 2002. Edmonton has a wonderful network of natural areas, including forest, grassland, wetlands, lakes and river valley areas. The North Saskatchewan river valley and ravine system is the backbone of the city's ecological network, or system of natural spaces. 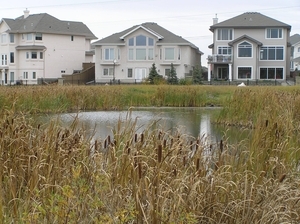 There are also many smaller natural areas in Edmonton's older neighbourhoods, in newly developing areas, and in the agricultural areas at the edge of the city. Native biodiversity (the diversity of life forms that are naturally found in Edmonton) is a good indicator of the health of our environment. Natural areas support the highest biodiversity in our city, but they are not the only places where nature thrives. Increasingly, nature can be found in the spaces between these larger protected areas: in backyards and schoolyards, in community gardens and constructed wetlands, on farms and in industrial areas. As people take action to naturalize all kinds of areas, we are building and strengthening our ecological network. To learn more about Edmonton's vegetation communities, check out the urban Primary Land and Vegetation Inventory and its associated interactive online map. For more information about Edmonton's biodiversity, including details about local plant and wildlife species, check out the Edmonton Biodiversity Report. For directions on the construction of wildlife passages please refer to the Wildlife Passage Engineering Design Guidelines (15MB). This document is an important tool for maintaining and restoring our ecological network by supporting the movement of wildlife through the city. For more information, see The Way Ahead, The City of Edmonton's Strategic Plan. The Office of Biodiversity coordinates biodiversity protection for the City. The Office works with other departments to ensure that natural areas are protected, restored and managed, and that opportunities exist for community members to get engaged in the stewardship of natural areas. Edmonton's natural areas can be found throughout the city. This map shows the location of natural areas - both those that are currently protected and those that are not. As of 2011, Edmonton had almost 3,900 hectares of protected natural areas. Some of these areas are on private land and have not yet been protected, but many are owned by the City and are accessible to the public. Check out our Natural Area Parks section for more information about natural areas you can visit! Explore Edmonton's Natural Areas with the Urban BioKit! Are you interested in learning more about our local natural area parks, but not sure where to begin? Check out the Urban BioKit, a colourful workbook full of engaging activities designed to help new Canadian families and others explore the wonders of Edmonton's nature. The BioKit can be downloaded, printed and used at any natural area park in Edmonton. Please contact naturalareas@edmonton.ca for details. Directions for the construction of wildlife passages to support the movement of wildlife through the city. An international association of local governments committed to sustainable development.